Life by the Creek: A New Bookshelf! 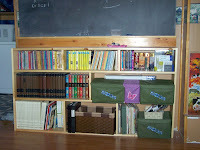 As the kids get older, and read more, we are collecting more and more books. I think it's a good thing. But, we were running out of space. So, we decided to move the bench that we had sitting under the chalkboard, and Jeff built me a bookshelf to fit under the chalkboard. Isn't it pretty?? All of my knitting/crocheting/cross stitching fits in the green boxes, Becky's knitting fits in the pink box, the kids colouring books and crayons fit into the brown box, and there's still room for... the books! 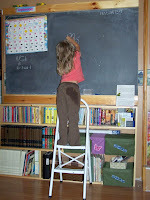 :D And, we happened to have a small, two step ladder kicking around, so it is now the chalkboard ladder. 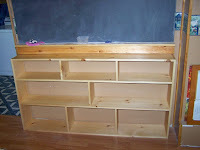 It means that the kids can't all colour at once, (at least, the short ones) but it stores neatly beside the bookshelf. Yay! I also love organization! We cleaned out our shed and basement this weekend. You wouldn't believe the type of junk that got left behind by the old people we bought the house from. There were metal dealies that I honestly could not conceive a purpose for. So weird. But now it is CLEAN! Yay! Hooray for organization! And it's pretty!! There's something awesome about pretty organization. Now I want a shelf. Makes the room look bigger, too. Less projection into the room or something.